It seems like JLo's latest look did not go down too well with the Internet users. There's no denying the fact that Jennifer Lopez is one of the most stylish stars. From embracing current trends to setting new ones, JLo has done it all. But seems like her latest look did not go down too well with the Internet users who mocked the star for swapping her pants for denim boots. Inspired from a pair of regular denims, the denim-boots featured back pockets, belt loops with a black belt that showcased the brand's logo in gold. [post_ads]The American singer-actress, who stepped out in a crisp white loosely-fitted, long-sleeve shirt dress teamed with a pair of slouchy, over-the-knee denim boots from Versace’s Resort 2019 collection, was ridiculed online for making a choice as weird and 'unfashionable' as that. 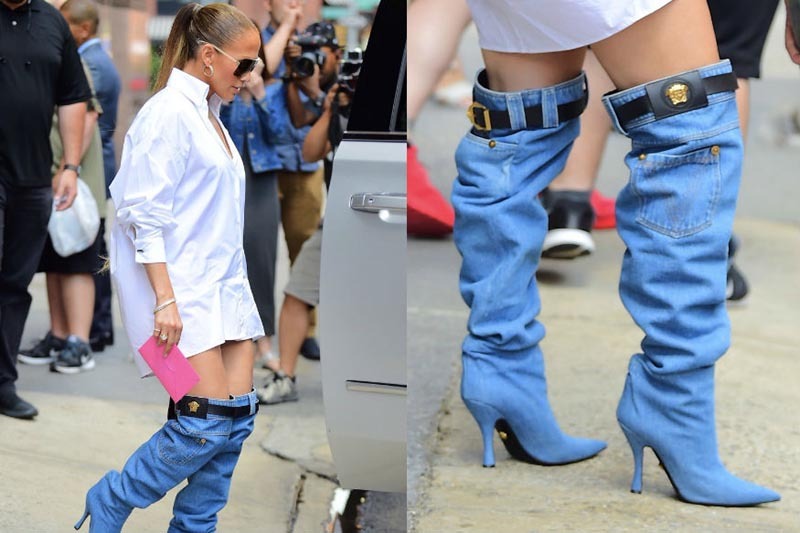 "I stared at this image for about five minutes try to figure out why Jennifer Lopez had her pants around her ankles in public before realizing they were boots. Don’t think I’m in the wrong here," a Twitter user wrote. "Okay now what kinda fashion trend is this I first thought her pants are falling down," wrote another. However, JLo had her share of support from her fans on the Twitterverse as well, who were quick enough to jump to her defense. To everyone upset about these boots: She's a fashion leader, not a fashion follower.